Various Artists: Swampland Jewels. Compact disc and vinyl LP. Southern Folklife Collection/YepRoc Records YEP-2498. A compilation of classic Cajun, zydeco, rock ‘n’ roll and rhythm and blues from East Texas and Southwest Louisiana released by Goldband Records – one of the most vital and important documentarians of endemic southern music in the 20th century – Swampland Jewels features recordings by Jo-El Sonnier, Boozoo Chavis, Iry LeJune, Jr., and Cleveland Crochet. Dolly Parton: Puppy Love/Girl Left Alone, 45 rpm 7″ vinyl single reissue for Record Store Day. Southern Folklife Collection/YepRoc Records YEP-2495. Dolly Parton’s first single “Puppy Love” b/w “Girl Left Alone.” Originally released in 1959 by Goldband Recordings. Limited edition of 2500 worldwide. 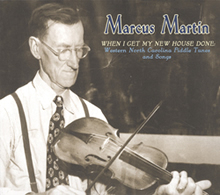 Marcus Martin: When I Get My New House Done: Western North Carolina Fiddle Tunes and Songs (University of North Carolina at Chapel Hill/North Carolina Folklife Institute, 2007). Compact disc featuring twenty-six field recordings of fiddle and banjo tunes and songs accompanied by a 16 p. notes. Marcus Martin, one of the finest old-time musicians from Western North Carolina, had a legendary fiddling style. The Southern Folklife Collection presents rare and unreleased 1940s field recordings of this acclaimed master fiddler recorded in his prime by Alan Lomax, Jan Schinhan, Artus Moser and Margot Mayo. 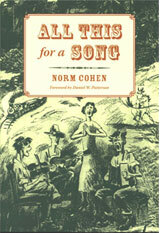 All This for a Song by Norm Cohen (Southern Folklife Collection, 2009). 426 p. ISBN: 0615314805. All This for a Song is the second volume in the SFC’s Vernacular Music Reference Shelf – an ongoing series intended to provide scholars, musicians and aficionados with a collection of materials to aid in the study and enjoyment of America’s wide range of vernacular musics, including country, blues, pop, gospel and ethnic genres. All This for a Song gathers together an important collection of sixteen case studies, originally published between 1895 and 2003, that demonstrate the variety of approaches scholars have used in studying and analyzing American traditional songs and ballads. The pieces examined range from sixteenth-century Anglo-American ballads to twentieth-century African-American blues and jazz songs and Hispanic American corridos. The volume also includes an extensive bibliography of more than on thousand song, ballad, and tune studies published in dissertations, books, journals, and album notes from the mid-nineteenth century to the early twenty-first. 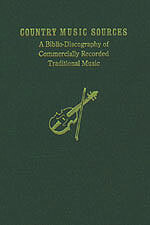 Country Music Sources: A Biblio-discography of Commercially Recorded Traditional Music by Guthrie T. Meade, Richard Spottswood, and Douglas Meade (Southern Folklife Collection/John Edwards Memorial Forum, 2002). 1002 p. ISBN: 0807827231. Talking Guitar, by Jas Obrecht (UNC Press/Southern Folklife Collection, 2017). 320p. ISBN: 9781469631646. In this lively collection of interviews, storied music writer Jas Obrecht presents a celebration of the world’s most popular instrument as seen through the words, lives, and artistry of some of its most beloved players. Readers will read–and hear–accounts of the first guitarists on record, pioneering bluesmen, gospel greats, jazz innovators, country pickers, rocking rebels, psychedelic shape-shifters, singer-songwriters, and other movers and shakers. In their own words, these guitar players reveal how they found their inspirations, mastered their instruments, crafted classic songs, and created enduring solos. Also included is a CD of never-before-heard moments from Obrecht’s insightful interviews with these guitar greats. 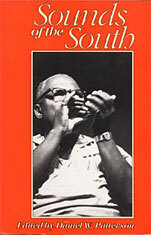 Sounds of the South, edited by Daniel W. Patterson (Duke University Press, 1991). 219p. ISBN: 24469275. Beyond the familiar forms of Mississippi Delta Blues and mainstream country music, the vernacular music of the South also ranges from the ceremonial music of Native Americans, to “shout” singing in South Carolina sea islands, Cajun fiddling, and Mexican-American conjunto music. Sounds of the South assesses past efforts to document these richly varied musical forms and the challenges facing future work. “Sounds of the South”—a 1989 conference that gathered record collectors, folklorists, musicians, record producers, librarians, archivists, and traditional music lovers—celebrated the official opening of the Southern Folklife Collection with the John Edwards Memorial Collection at the library of the University of North Carolina, Chapel Hill. Based on that conference, Sounds of the South includes Bill Malone’s account of his own career as fan and scholar of country music, Paul Oliver on European blues scholarship, and Ray Funk on researching Black Gospel Quartets. The introduction quotes extensively from panel discussions with Hazel Dickens, Dave Freeman, Bess Lomax Hawes, Ralph Rinzler, Mike Seeger, and others. The contributors look at a number of topics related to the role of the archivist/folklorist in recording and documenting the music of the South—evaluating past fieldwork and current needs in documentation, archival issues, prospects for the publication of recordings, and changes in music and technology. Written in an accessible style, this volume will be of interest to all those concerned with preserving the music of the American South.